Here's a little manicure that did recently. I'm going back to my roots with some Barry M. This is one of the very first brands that I've worn, even before starting my blog nearly two years ago. As pleased as I am with this manicure, I'm not so thrilled with my current nail shape. At this length, I think they'd look better squared, but my middle fingernail is just so short. This shade is perfect for the summer...it did take a while to get to us over here in the UK and I'm dubious as to how long it will actually stay with us! The lines were created with acrylic paint. They could have been steadier, but I used the wrong brush - I should have used a long thin striping brush, but I used a short fine detailer instead. Do you spy the dent on my index finger? It magically appeared in the morning! I don't know what you'll be doing this coming week, but whatever it is, I hope it's great. By the way, if there is anything you'd like to see me do (any nail art, tutorials or topics), then please leave a comment below and if it's something I think sounds good, I may try it. This is 'Candy Shop' by Claire's. I actually won this in a giveaway hosted by Beau's Mom a few months back. I used a creamy pale pink over this polish in an attempt to make a 'jelly sandwich'. I don't quite think it was a sucess, but I liked it nonetheless. Oh and here is me posing with me my new iPhone case. 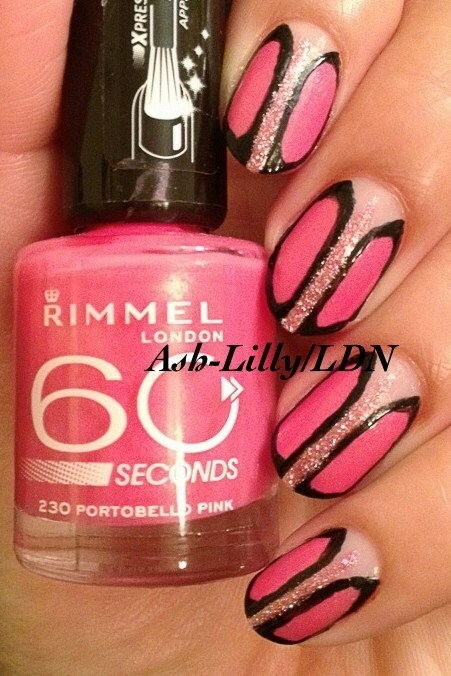 This is a polish that one of my lovely Instagram friends send to me. Okay, that's it from me. I hope you have a lovely weekend! On Sunday it was my daughter's second birthday and because she loves animals so much, we all went to London Zoo on the Saturday, as a warm-up celebration. She loved it, but she didn't like the Gorilla's. She spent most of the time wrapped around my neck when she eyed those bad boys. One thing she did like was the butterfly house. It's literally a tent-like structure hosting an artificial tropical climate and hundreds of butterflies. They have big ones the size of your hands and tiny little ones which land on you if you aren't screaming your head off. I hate this nail length, but this glitter IS pretty! I was trying to capture the wings. 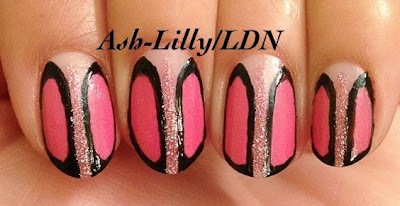 I like the design better on a longer 'nail'. Right, I'm off to go and find something to plaster onto these nubbins of mine. I hope you are having a lovely week. Thanks for all of your nice comments and support. I don't always get a chance to reply or visit other blogs nowadays but I'm going to change that! I realise that I haven't been very creative of late so I decided to break out the nail stickers. I've seen similar tip manicures on Ying's site, so I thought I'd do my own. I need to stop being so lazy and actually use my camera, as opposed to the camera on my iPhone. I don't have a huge amount to say about this manicure other than that I'm bored of it after only one day of wear! Oh, by the way, you see that middle fingernail? It's wonky but I can't file it anymore. If I do, I'll be filing my skin! Gel nail polish? Nooo...okay, maybe. Hey nail pals, how are you? Me? I'm blocked up, can't hear out of my left ear, have a runny nose and a throat infection...good times. Only goodness knows how I got this nasty bug, but it won't get the better of me! Despite being dead on my feet today, I attended a gel polish training event with a company called Profile. Their gel polish line is called Gellux and now that I'm providing treatments to clients, I can't not offer a gel polish...despite my feelings about it. I used to pride myself on being a staunch conscientious objector (to gel polish of course), and I had poo-pooed the idea ages ago. I mean, how can a person wear the same nail polish for two whole weeks? It's sacrilege I tells ya. Anyway, I sat there with a bunch of other women with varying skills and was told how amazing Gellux was. I was told that someone would work on me - something I hate, especially when the person working on me doesn't know how to hold a nail file. Luckily, as there were odd numbers, the tutor said that she'd work on me. I say luckily. After she nearly stabbed my fingers to death with her 'cuticle handy' (metal cuticle pusher), she did this to me. Erm. No. That's. No. Good. When a nail line carries one of those great flat precision brushes, you should really try to use them correctly. Rather than use the wide side of the brush, she turned the brush and used the narrow side. I was so shocked when she'd finished and the hairdresser who painted my other hand was far better! I was even more deflated when I remembered that I couldn't take the bloody manicure off without having to soak it off!! The manicure does the Gellux no justice. It has a nice brush, nice consistency and when it is dry, it has more shine than Seche Vite (but doesn't have the shrinkage issue). There are some nice colours in the line too. Soak off was pretty straightforward. We filed off the shiny gel layer, wrapped nails with acetone soaked cotton pads and used foil. Hands were put into heated mittens and after about 20 minutes, we were able to scrape the crumbly Gellux off. I've heard that there are other lines that take less time to remove and don't need to be filed, but I have nothing else to compare this to yet. I just couldn't walk around with these bare side walls, so I stuck some gems and pearls on! I'm going to try to keep this Gellux on for at least a week, to see if the claims are true. I will say that if you want an alternative to gel or acrylic overlays to grow your nails, you could try using a gel polish base coat. My middle nail was quite weak after removing an extension recently and right now, it feels well reinforced. The tutor had clear Gellux on her nails, but she'd used about 20 layers...it was all thick and horrible. But that was her own technique, not the product. Okaaay, so there is a little bleed on the side walls, but that's because my partner was having the Gellux scraped off her right hand and she was bouncing around a lot. Okay, I'm off to bed to get some well deserved rest. Don't worry, as much as I like the stuff, it will never take the place of my lacquer! Let me know how you feel about gel polishes. Today I'm actually missing my long nails. I love the fact that my typing speed is now back to normal (lightening speed), but my fingers are looking a little stumpy. Never mind, they'll grow back! I'm wearing this today. I chose this colour simply because I am participating in a contest on Instagram and the theme is #freakinpink. I have so much love for Rimmel. I love their precision brushes, 60 seconds range, the Professional and Lasting Finishes and also the Fruities range, but I do wonder what they are doing in terms of updating their polish line. With all the nail-art-in-a-bottle trends that have come out over the last year or so (crackle, magnetic and colour changing polishes), they only seem to have put out a couple of crackle colours. Please correct me if I'm wrong, but I've seen nothing much else. Now, I go polish shopping the way some women go shoe shopping. I investigate, I scour, I hunt, I rummage, I get my magnifying glass out and get my Miss Marple on. Alas, the Rimmel display always makes me feel like I want to throw myself onto the floor and scream...much like my nearly-two-year-old did when I told her we were leaving my big girl's school summer fair today. So got herself into such a stink that she ended up on her hands and toes, yelling, in the middle of the year two playground. Like she was going to do a set of press-ups. Yup. If you're not in the UK, or if you are and have seen some newer or more exciting things on the Rimmel polish front, please let me know. Meanwhile, I'll tweet them a question and hope they come back with some good news and don't just blank me like Maybelline did a while back. Wish me luck! Oh friends, friends...I've missed you. Honestly? I haven't been well. I've been burning the candle at both ends, struggling with a chronic condition which has really, really put me through the wringer recently and failing to down tools. On Sunday I spent the entire day on the sofa, in and out of sleep (with my babies prodding me every so often to ensure I was still alive) thanks to rather strong painkillers...all to be back at my office desk on Tuesday, still feeling like death warmed up. I'm partly to blame for my slow recovery. If I took my medication when I was supposed to and rested when I was supposed to I might not still be in my current funk. Here are a few pictures of what's been happening (nail wise) since I last posted. Sorry if you've already seen these on Instagram. 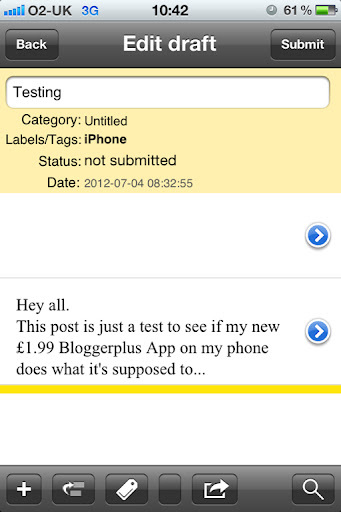 I really want to be able to blog on the go from my iPhone, but I just can't get blogger to co-operate! If you know what to do or it has worked for you, PLEASE let me know? I made the decision to chop my nails off last night. I was fed up with them actually, so it's nice to have a change. Help me out with this blogging on the go via iPhone malarkey please folks!